This Thai Chicken Salad comes together in just 20 minutes! Tossed with a tangy lime-lemongrass dressing and served alongside colorful vegetables. It’s a delicious and easy lunch or dinner. Here I am bringing you yet another Thai dish. I really cannot get enough of the bright, zesty flavors of Thai food. Cilantro, mint and spices always seem to make up the backbone of my Thai dishes. That combination is like a magic potion – It brings life to anything! And then there’s the fish sauce. As I warned you before, don’t be scared of the fish sauce – It can smell quite pungent out of the bottle, but once it gets mixed with the other ingredients the flavor really does mellow out. I’ve been able to find the fish sauce and lemongrass right in my local supermarket. 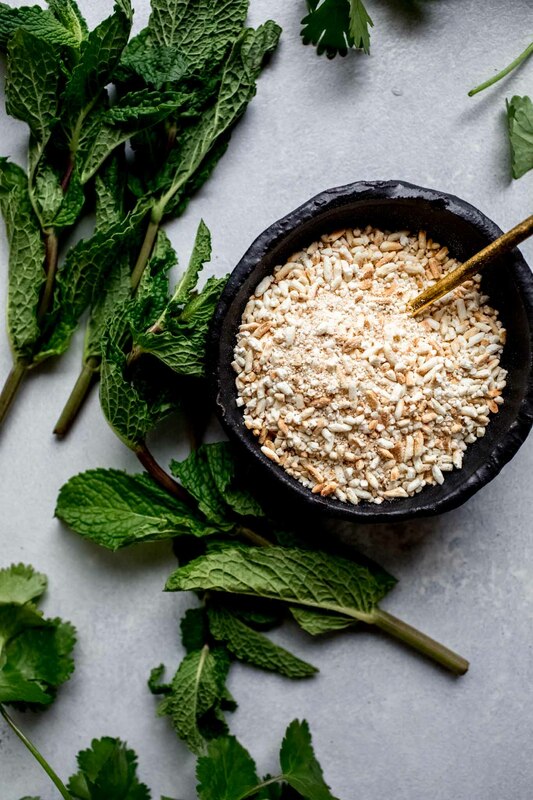 Look for the fish sauce in the Asian foods aisle, and look for the lemongrass either in the fresh herbs section of your store, or in the general produce section. Lemongrass looks like thin, pale green stalks and it’s generally sold in bundles of two or three. You’ll need about three stalks for this recipe because only the lower stalk (near the bulb) is tender and edible. How Do You Cut Lemongrass? When cooking with lemongrass, you only want to use the tender part of the bulb section. To cut lemongrass, first remove the knobby end of the stalk and cut it in half lengthwise. Remove the tough outer leaves and find the inner tender flesh (it should pierce easily with your fingernail). Then, finely chop that tender inner section. Another special ingredient that I’m using in this Thai Chicken Salad is toasted rice powder. I like to think of the rice powder as my Thai alternative to croutons. It gives an amazing crunch to your finished salad. It’s also got a nice, nutty, creamy flavor. How Do You Make Toasted Rice Powder? To make toasted rice powder, heat a skillet over medium heat. 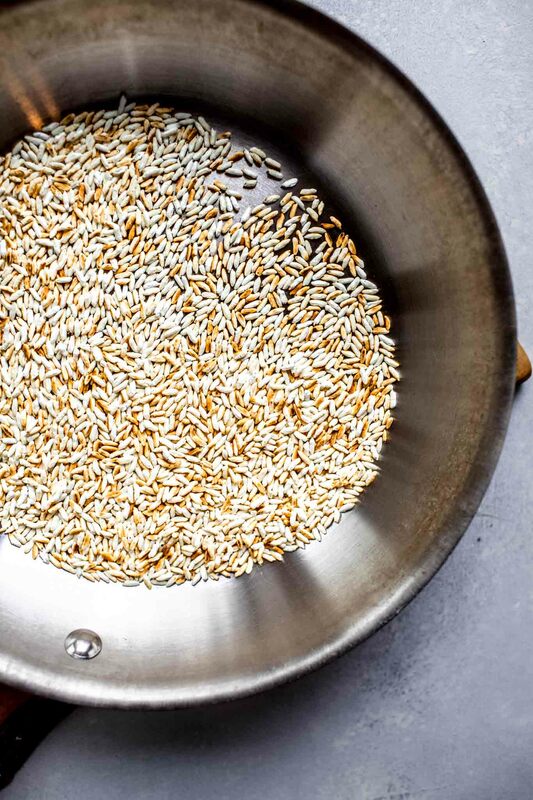 Then dry roast the rice tossing constantly until it turns a golden brown color and becomes fragrant. At first, you won’t see anything happening, but then the color change comes quick. It will become wonderfully fragrant, almost like popcorn. Then, you’ll need to grind the rice to a coarse powder. To do this, I use a coffee grinder that I use exclusively for grinding spices. But, you could also use a mortar & pestle or even a blender. The rice powder takes a little bit of extra effort, but I guarantee that it’s worth it! 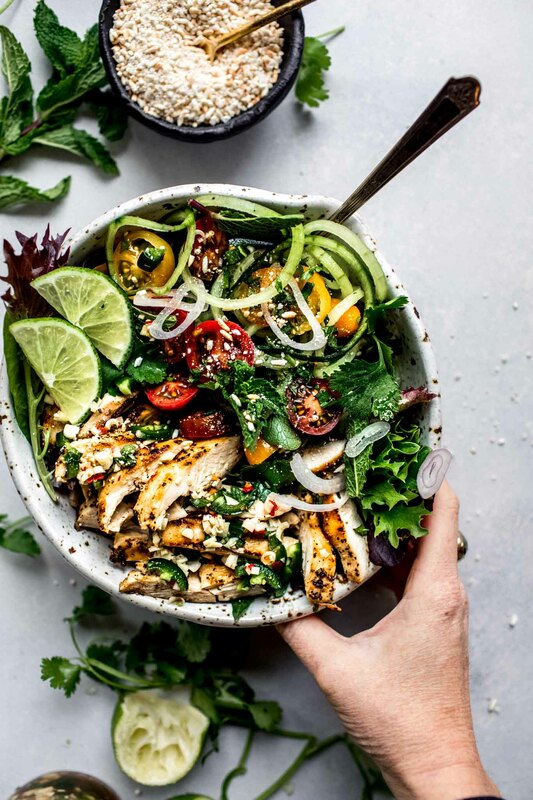 One final tip I have for making this Thai Chicken Salad is to be sure to pound your chicken breasts to a uniform thickness before cooking them. 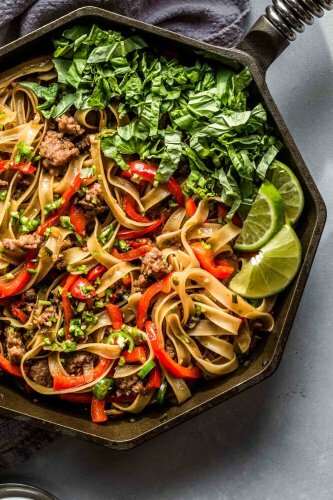 You can do this using a meat mallet, or even a heavy skillet. Or, you could also look for chicken cutlets in the store, those will already be pounded to a uniform thickness for you. 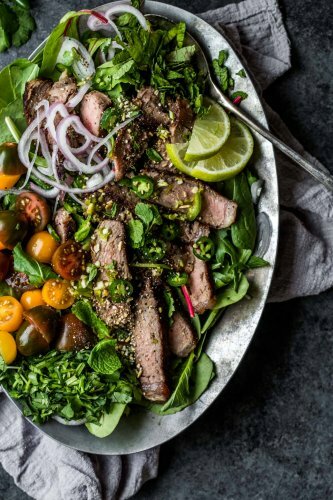 Speaking of meat, this salad is also great with steak or pork. And regardless of which type of meat you use, be sure to let it rest for five minutes after cooking. Then slice it up and add any accumulated juices to your dressing mixture. 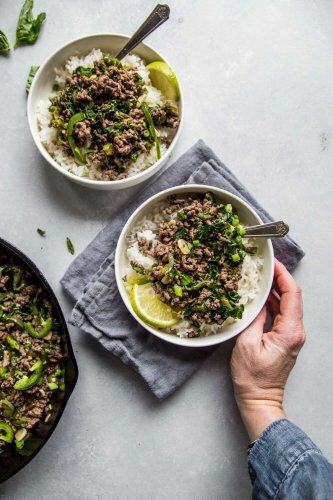 You have the option of serving this dish over rice or lettuce, or both. You could also make lettuce cups and serve the mixture wrapped up in there. Cheers friends! 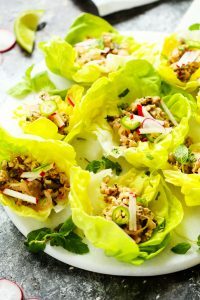 If you loved this Thai Chicken Salad recipe I would appreciate it so much if you would give this recipe a star review! Also, be sure to snap a picture of your finished dish and share it with me on Instagram using the hashtag #platingsandpairings and tagging me @platingsandpairings. 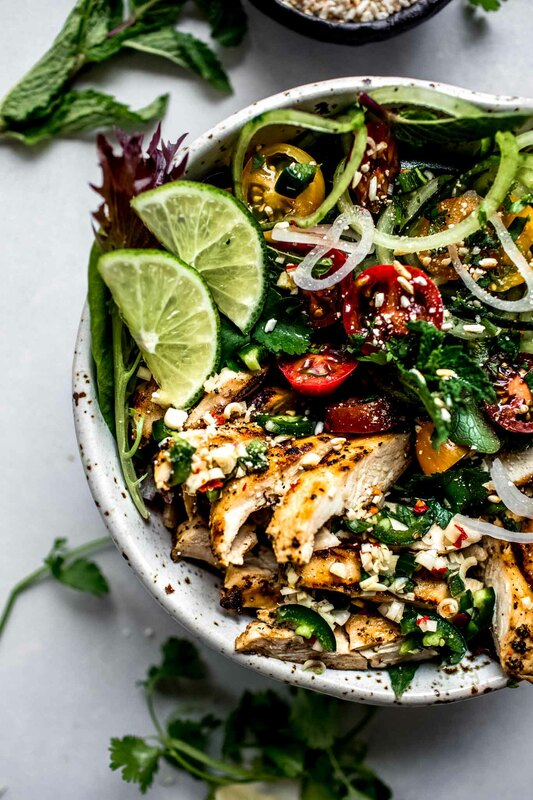 This Thai Chicken Salad comes together in just 20 minutes! Tossed with a tangy lime-lemongrass dressing and served alongside colorful vegetables. It's a delicious and easy lunch or dinner. Season the chicken with salt and pepper and cook by grilling or sautéing for 5-6 minutes per side. Let cool slightly and thinly slice. Meanwhile, make the dressing. For the dressing, combine garlic, jalapeno, lime juice, fish sauce, lemongrass, brown sugar, and red chile flakes in a small bowl. Stir well. 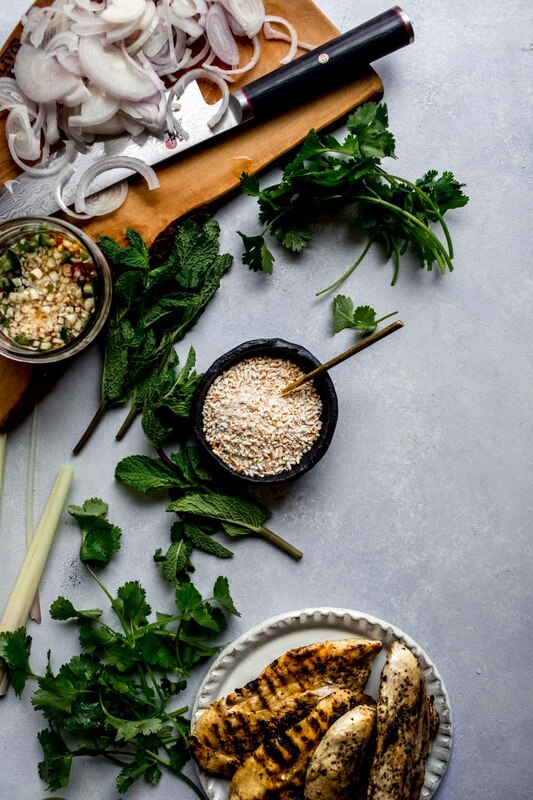 In a medium bowl, combine the cooked chicken, shallots, mint, and cilantro. Toss with the dressing. Add the ground toasted rice, if using, and toss again. Serve over lettuce or rice. This recipe was originally published in 2014. It was updated in 2019 to add in new photographs and content. The recipe remains the same. Enjoy! Dry Riesling pairs great with spicy dishes, especially with this salad. 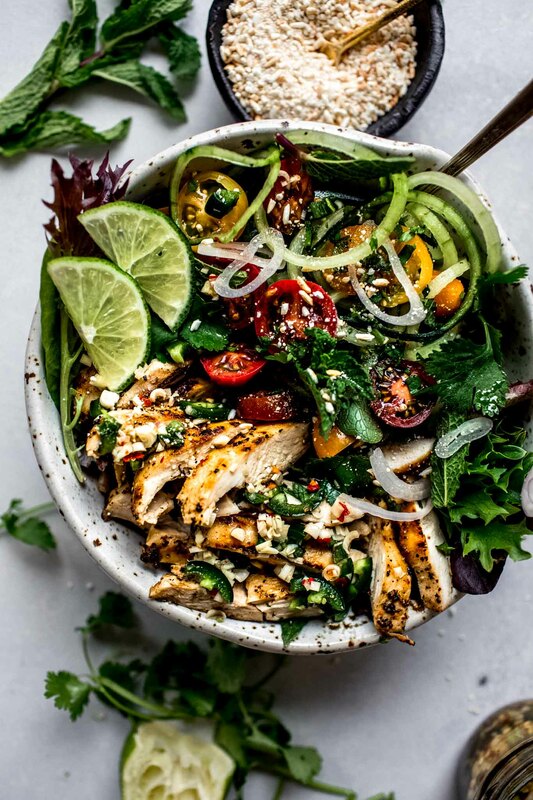 This chicken salad looks incredibly delicious! Definitely a recipe I need to make. 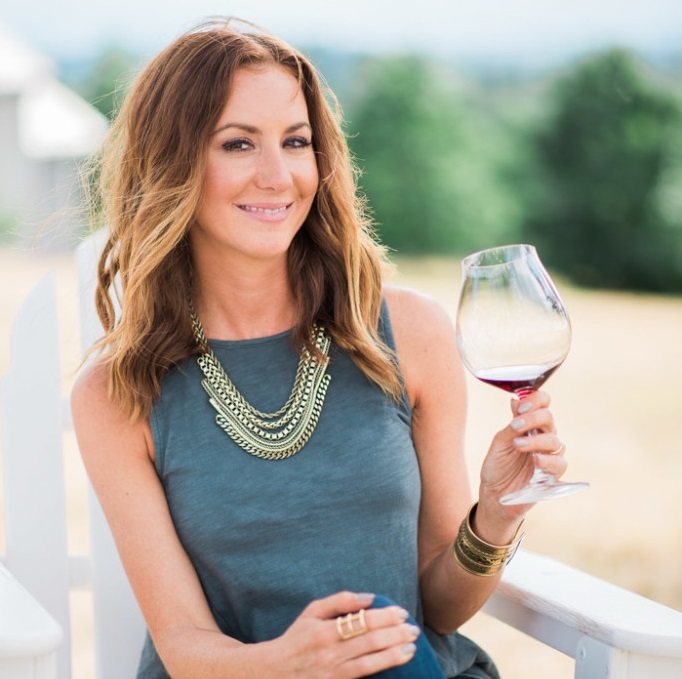 Hi Erin, great looking recipe. Particularly like your concept of matching food with an appropriate beverage. I think you compose and frame your photos perfectly. Thanks Richard – Just checked out your site and it’s looking amazing as well! I’ve never used rice powder, but I’ll have to get some because This salad looks delicious. Christine – The rice powder is SO easy to make, adds a great nutty flavor, and a great crunch! I put it on all of my Thai-style salads! So many great ideas in here from rice powder to wine pairings. I want to try it all! This looks fantastic! I love thai food, so I know I am going to love this just from looking at it! Can’t wait to try it! Thanks Michelle! It’s a great dish for hot summer weather! What a gorgeous salad. The dressing sounds particularly delicious with the bite of jalapeno! Made the salad and it was delicious. Did you spiralize those cucumbers?